The rebuilding of Europe during the decade following World War II created a huge market for economical, short distance city cars. 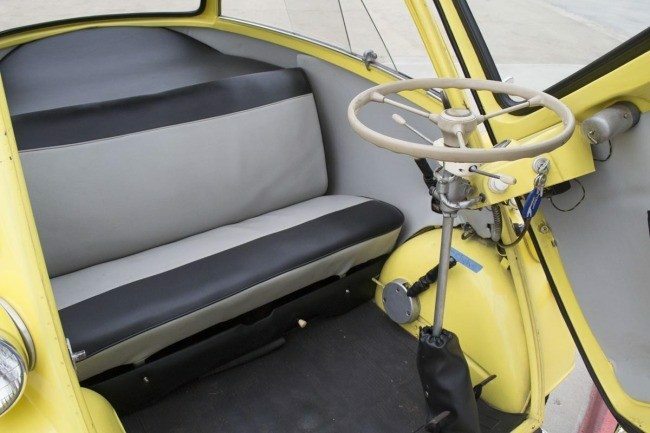 The Iso Isetta originated from the Italian firm of Iso SpA, a company that originally began building compact three-wheeled trucks, motor scooters and refrigerators. In the early 1950s Renzo Rivolta hired Pierluigi Raggi and Ermenegildo Preti to design the Isetta with a scooter engine. Isetta means little ISO in Italian. The designers came up with the design by taking two scooters; placing them close to each other and adding a refrigerator-style door before shaping the result like ‘a teardrop in the wind’. The Isetta was introduced to the world at the Turin Motor Show of 1953. The micro-car was an instant success, unlike anything seen before, and went on to be built in many countries. 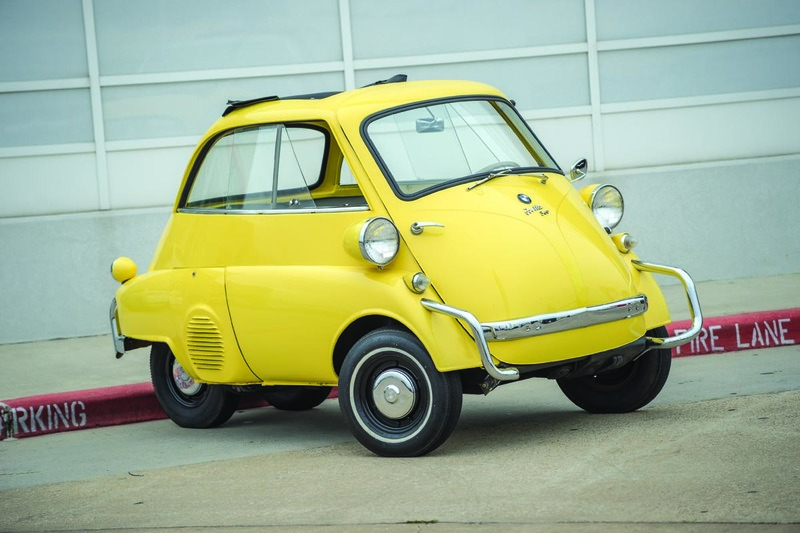 Germany’s BMW, struggling to rebuild from the destruction of war, gained license to manufacture their version of the Italian Isetta as a thoroughly re-designed model using the BMW 1-cylinder, 4-stroke motorcycle engine rated at 13 horsepower. 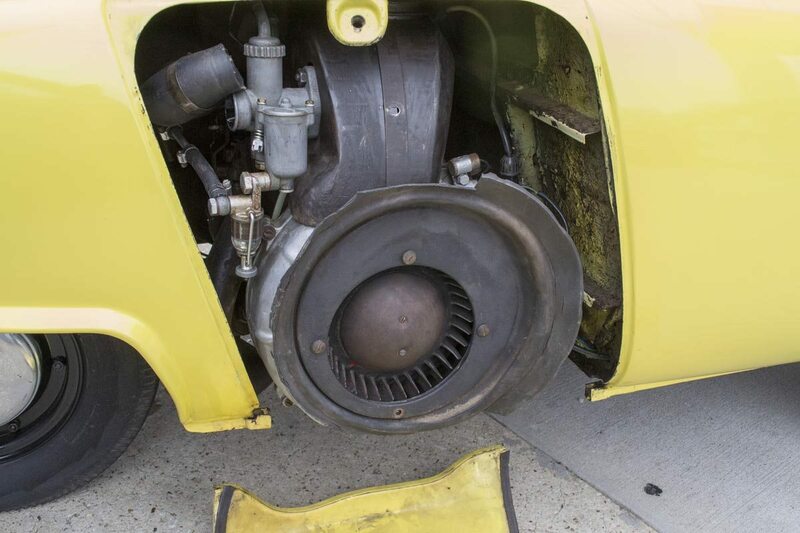 The 247cc, BMW engine was a considerable improvement from the Italian 2-stroke, 9.5 horsepower version. Although similar visually, BMW’s re-design made almost nothing interchangeable between the cars. By 1958, BMW has upped the size of the engine to 298 cc, and replaced the bubble windows with sliding units for ventilation, making these late 50’s Isettas some of the best ever. Mated to a motorcycle 4-speed transmission, top speed of the Isetta 300 was over 50 MPH and delivered about 63 miles per gallon of gasoline, making the car ideal for infrequent, short distance driving. BMW built the 300 until 1962 with a total of 161,728 produced. Collectors have been watching and investing in these iconic micro-cars for quite a while now, and their inherent cuteness and practicality make them almost essential for any complete collection.